UPDATED: Thu., June 28, 2018, 5:22 p.m.
Gonzaga’s 2018-19 men’s basketball schedule is nearly complete. 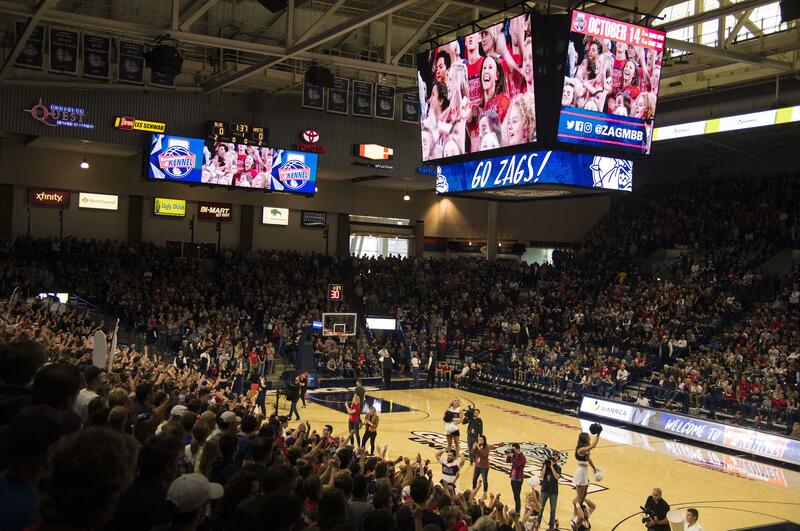 The Zags will entertain North Dakota State (Nov. 26), North Alabama (Dec. 28) and Cal State Bakersfield (Dec. 31) at the McCarthey Athletic Center. Those three additions leave one opening for the upcoming season. Most of Gonzaga’s marquee matchups have been announced, including road dates with North Carolina (Dec. 15) and Creighton (Dec. 1), home contests against Texas A&M (Nov. 15) and Washington (Dec. 5), and a neutral-site showdown versus Tennessee (Dec. 9) in Phoenix. Pairings haven’t been announced for the Maui Invitational, which features Gonzaga, Duke, Arizona, Iowa State, Illinois, Xavier, Auburn and San Diego State. North Dakota State (15-17 overall) tied for fifth in the Summit League with a 5-9 record last season. Guard Paul Miller, No. 5 on the school’s all-time scoring list, graduated, but guard Cameron Hunter (10.4 points, 3.4 rebounds) returns after making the Summit’s all-newcomer team. Tyson Ward, a 6-foot-6 guard, is the top returning scorer at 11.8 points. GU defeated the Bison 86-76 at KeyArena in Seattle in the 2015 NCAA Tournament opener. NDSU was No. 214 in NCAA RPI at the conclusion of the 2018 season. North Alabama is beginning a four-year transition to Division I this season. The Lions, who have a new head coach in Tony Pujol, are members of the Atlantic Sun Conference. They finished 15-13 last season, including a 10-10 record in their final season in the Division II Gulf South Conference. Cal State Bakersfield, No. 225 in RPI, finished 12-18 overall, 5-9 in the WAC last season. The Roadrunners lost in the WAC Tournament quarterfinals. The team’s top three scorers return: rising senior Damiyne Durham (12.3), senior guard Rickey Holden (10.7) and sophomore guard Jarkel Joiner (10.4). The Zags, led by returners Josh Perkins, Zach Norvell Jr., Rui Hachimura, Killian Tillie and Corey Kispert, and San Jose State transfer Brandon Clarke, are projected as a top 10 team. Gonzaga’s non-conference schedule features probable top 10 showdowns with Tennessee and North Carolina. Auburn and Duke, potential GU opponents in Maui, also could be in the top 10. Published: June 28, 2018, 1:11 p.m. Updated: June 28, 2018, 5:22 p.m.